I know it has been more than the promised “couple of days” since my last art doll in progress post. I do however have two finished sculptures to share with you, so hopefully that can make up for the delay. My secret keeper review now has her complete costume and coiffure. She appears to me to be a wise keeper who will not be sharing the confidences you relay to her. I’m not sure exactly what magic is contained in the blue gem she holds, but I can only guess that it is quite potent and effective. 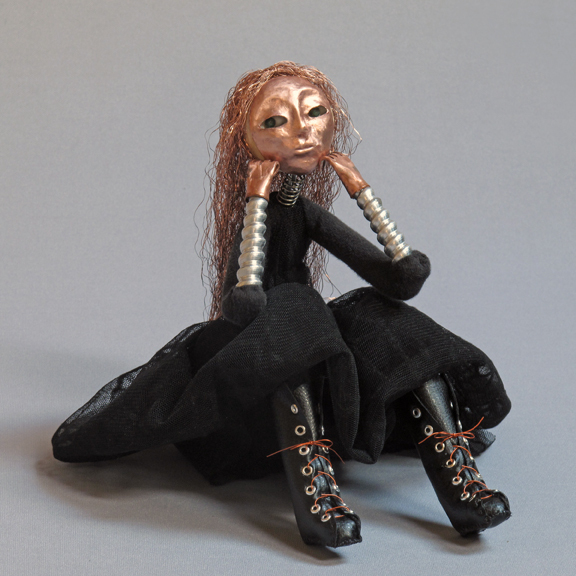 This art doll figure has a half mask of hammered copper over a paperclay sculpted face and torch fired enamel eyes. Her snowy curls are made of natural wool fibers. Secret’s rich fabric clothes are sewn in place over a padded wire frame. This sculpture is also a look back at an earlier piece I titled “Spring”. 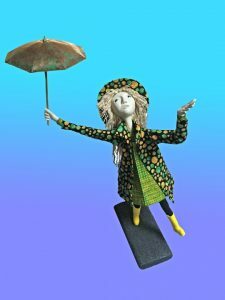 In my constant striving to introduce increased gesture, expression, and narrative into my work, “Sunshine on a Rainy Day” shows that she isn’t deterred by a little bit of rain. Her umbrella bearing predecessor merely posed quietly showing off green boots and a parasol that matched her dress. “Sunshine on a Rainy Day” in contrast seems to be enjoying her walk in the rain. 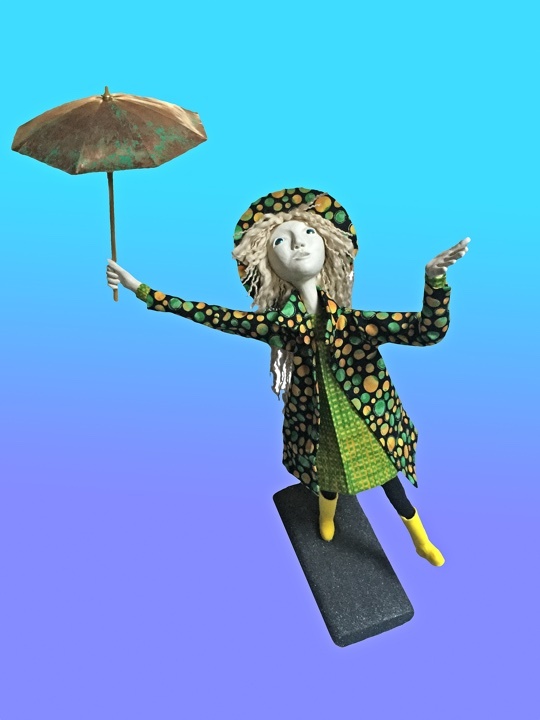 This art doll is costumed in yellows and greens highlighted by a pair of bright yellow boots. The umbrella she is holding aloft is made of copper tooling foil. Sunshine has paperclay sculpted head and hands, and her eyes are made from dark iridescent glass beads that seem to glow on their own. 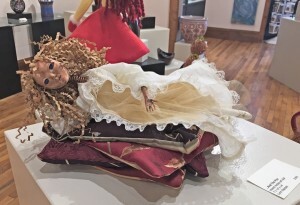 Art Dolls in Art Show. 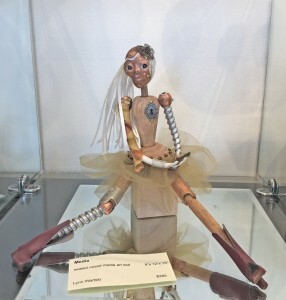 This entry was posted in Art Dolls, Art Shows and tagged art doll, Art doll show, copper, Doll show, figure, figure sculpture, Hillsborough Gallery, mixed media, one of a kind, OOAK, opening reception, sculpture, steampunk, the Hillsborough Gallery of Arts on September 14, 2016 by lynnadmin. I have been away from the studio for a couple of weeks traveling, so I do not have a new completed art doll to share with you. However, I did have one figure waiting patiently on the work table for my return for completion. I’m not completely set on a title just yet, but she is a new take off on an earlier art doll sculpture titled “Secret Keeper”. Unlike her predecessor, who was costumed in sort of an “Earth Mother” type style, this doll is covered in rich fabrics in an ornate style. Perhaps she has more valuable secrets she is guarding. At the moment, she looks a bit alien without her hair. I will be sure to share some new images when she is complete in a couple of days. This entry was posted in Art Dolls and tagged art, art doll, copper, figure, figure sculpture, mixed media, one of a kind, OOAK, sculpture, work in progress on August 18, 2016 by lynnadmin. Had a busy couple of weeks outside of the studio, and I don’t quite have a finished art doll to share with you today. So, I thought that instead I’d show you my current work in progress. Like the piece from my last post, Chello, this one is with inspired by earlier art doll sculptures, and is on the slightly larger scale that I I want to shift my figures to. 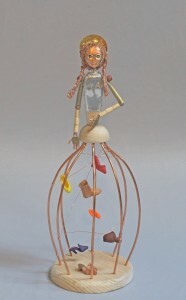 This current art doll figure sculpture is a third seated dancer figure who will be lacing up her toe shoes. I like to pour over internet images when in the thinking phase for a new piece. Degas’s dancers offer up a wealth of visual inspiration. I find myself drawn most to his behind the scenes pieces. Images of dancers stretching at the bar, engaged in conversation, and of course putting on their shoes, catch my eye. Those images make me imagine more of a story to go along with them, than a grand leap captured during the performance of someone else’s storytelling. Lacing III will be seated pulling across the ribbons of one of her shoes. Her eyes will be slightly down cast focusing on her task, and will draw the viewer down closer to see her fully. In the photo above you see her paperclay head and hands on her body’d wire armature. Her final position will be set after I have her all together to balance the gesture I want to achieve with the stability of her seated posture. I chose paperclay for this art doll’s hands. This choice will allow me to have greater control and detail since the eye will be drawn to what the figure sculpture happens to be doing. 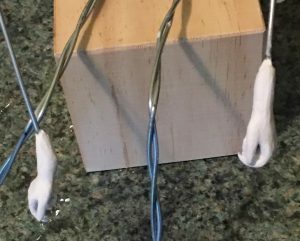 This image was snapped after my second layer of clay was added to the wire and floral tape hand armature. Additional shaping and sanding will refine their shape a bit more. One of the advantages of creating my art doll figures the way that I do, is that I can tweak and change things as I work. The sculptor that carves or chisels is confined by earlier choices and decisions. My figures are even more forgiving than those sculpted fully in clay, because I leave so much of the sculpture able to be repositioned. Even though my Lacing III art doll will have her eyes looking down at her shoe, I see from a quick test fitting with her copper face plate, that I will have to reposition her eyes just a bit. she looks just a bit suspicious of her doll artist sculptor at the moment. With any luck, Lacing II will be complete and ready to meet you in my next post. This entry was posted in Art Dolls and tagged art doll, art dolls, figure, figure sculpture, mixed media, one of a kind, OOAK, sculpture, WIP, work in progress on June 16, 2016 by lynnadmin. 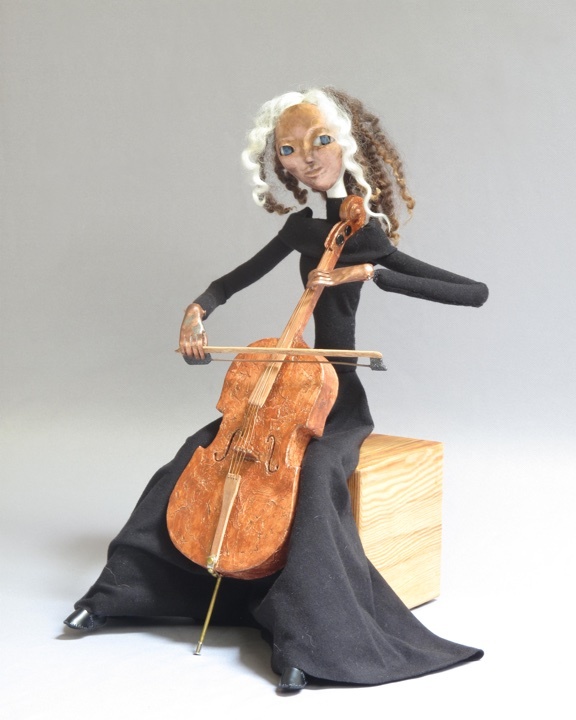 “Cello” started out as a thought when listening to a gallery customer who was trying to find my piece “psyche-Delia”, and then lamenting when she found out the art doll figure had been sold. Psyche-Delia, a psychedelic rocker, and her earlier flower-child inspiration, “Janice”, both possessed diminutive guitars that I had fashioned for them. I really enjoyed creating both of those art doll figures, and each had graced the front of my gallery artist bio-cards for a time as a representation of my work. The time seemed right for a new musician to enter the fold. Cello started in my metal studio with a hammered copper face, cut and brazed hands, and a pair of torch fired enamel glass eyes over brass brads. I chose to tweak the scale of all of these elements, as I’ve been thinking of changing the size of my art doll figures just a bit. I have had a few larger figures, and I like the extra presence they have as sculptural works. I chose to keep the figure itself rather simple and draw attention instead to the instrument she is playing. Cello’s cello I constructed from cardboard and modeling paste. Some careful cuts with an x-acto and patients while glue was setting was required, along with constant glancing back and forth to some reference photos. Though the “strings” of the instrument are plain copper wire, I was able to infuse a bit of musicality into the instrument by using discarded guitar string on the bow. The last element needed to bring life to Cello was her wigging. I used natural wool fibers from the sheep of HGA artist, Susan Hope, to provide Cello’s unique coiffure. Her long black dress and simple black “leather” shoes are hand constructed, and sewn in place. This entry was posted in Art Dolls and tagged art doll, cello, copper, figure, figure sculpture, mixed media, one of a kind, OOAK, sculpture on May 25, 2016 by lynnadmin. I know what you may be thinking. Why would a princess need a make-over? Aren’t they already ideal? 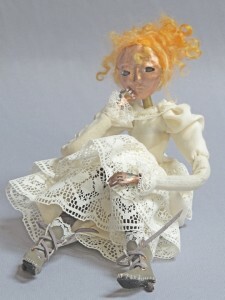 I do like to occasionally turn to fairytales and children’s literature for inspiration in my art doll sculptures. Though it is very fertile ground for ideas, it is also a well traversed bit of land. Many of the images we hold in our heads of these characters are the saccharine sweet animated versions. One or too may be so much so, that they can even cross the line to annoying for some of us. I have to admit that I personally have had that reaction to the animated Snow White, and have long thought she could use some updating. My “Different Snow” art doll figure takes a cue from the writing of Gregory Maguire and perhaps a bit of flavor from the more current “Huntsman” movies. She is beautiful and strong, and can fend for herself, thank you very much. My Snow did not get tricked by the poison treat she was offered. She has it in hand, and instead has every intention of returning the gift to the giver, with perhaps an additional statement from her sword. She is dressed a bit more appropriately for battle than serenading birds. the “Different Snow” sculpture stands 15 inches high on a custom made stand. She has an armored “leather” tunic over her red velvet dress. Her battlefield crown sits on her helmet, and armored leggings are tucked into her heeled boots. I chose to sculpt Snow’s face and hands from paperclay. The media allows for much more refined shaping of her features. The image used is Work-in-Progress, as I added a bit of lip coloring and some additional refinement of her fingers before applying a sealing coat to the paperclay. Snow is available and on display at the Hillsborough Gallery of Arts. 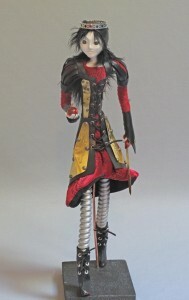 This entry was posted in Art Dolls and tagged art doll, figure sculpture, Hillsborough Gallery, mixed media, one of a kind, OOAK, sculpture, Snow White, steampunk, the Hillsborough Gallery of Arts on May 6, 2016 by lynnadmin. Last week I wrote about working on art doll sculptures that were somehow related to earlier works. I was working on one of those pieces, and she too led me to an interesting place by the time she was complete. She even told me what her name should be. I had been thinking about one of my own favorites among my art doll sculptures, Wednesday’s Child. She is the piece that I use as my profile picture on my Lynn Wartski Sculptures Facebook page. I like this particular art doll because of the amount of expression and gesture I was able to capture in her copper features. She is relatively simple in comparison to many of my figure sculptures. Just a seated figure clad in black, but her posture and face tell you all you need to know about her mood. Wednesday went to a good home quite a while ago. I wanted her reprise to have a very different look, but capture the same feel. I started with the same girl dressed at the turn of the 20th century look, but this time in all light hues. Where Wednesday’s Child had a very simple dress of black lace gathered at the neck, I chose to create a separate skirt and top with lace hems and cuffs this time. Her clothes being much more complex lends that “poor little rich girl” feel to Curl. I must admit that I had a working title something more like The Second Wednesday for this art doll. Her title screamed itself out the minute I decided to wig her with some of the natural wool I received from one of our other very talented Hillsborough Gallery of Arts artists, Susan Hope. I was going for sort of a “strawberry blonde” in the food coloring dye job I was doing. I put one single drop of red in with the twenty or so yellow I added, but bright orange it is. I decided to go with it, and the wonderful natural curl of the wool. I just couldn’t help myself in adding the accent curl that dips down into her forehead. So, The Girl With The Curl (in the middle of her forehead) she is. 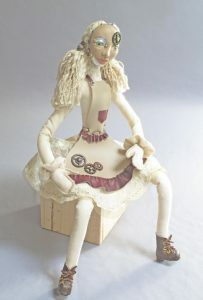 This entry was posted in Art Dolls and tagged art doll, figure, figure sculpture, girl with the curl, mixed media, nursery rhymes, one of a kind, OOAK, sculpture, steampunk, the Hillsborough Gallery of Arts, wednesday's child on April 1, 2016 by lynnadmin. 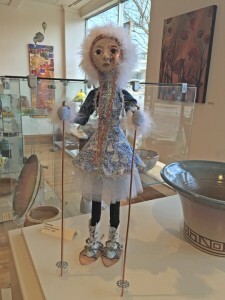 As I am working today in the Hillsborough Gallery of Arts, it seemed a nice opportunity it to revisit some of my art dolls displayed around the space. Many of my sculptures take their inspiration from their predecessors. I often find myself thinking of how I would execute a piece differently the minute I finish it. Most of the sketches I have been making for the work for my next feature show have been falling into this category. Though I am not quite ready to start sharing some of the works in progress with you, I thought I’d share a few that might pop up in a new form sometime in the near future. Fairytales, folktales, and children’s literature provide a wealth of raw material for my figures. Little Red Riding Hood and Alice in Wonderland are two that spring to mind immediately. “…And The Pea” is my nod to the the Princess and the Pea tale. My version is shown here reclining on several of her cushioned mattresses, and holding the source of her discomfort in her hand for the viewer to pay witness to. I believe my next fairytale inspired piece will involve some sort of poison fruit. “Media is one of my artist’s favorite pieces. She is currently the image I have on my gallery bio cards. Media is a great representation of my love of playing with all sorts of materials. The puzzle presented creating a sculpture like Media is the type of challenge I love working on. Snow Day, was created on a day that felt a little too cold to hammer metal in the outdoor studio, and was my first use of polymer clay in one of my art doll sculptures. I used one of the design choices from my very first art doll “No Rag Doll” by creating a face plate that is sewn on to a stuffed fabric head. 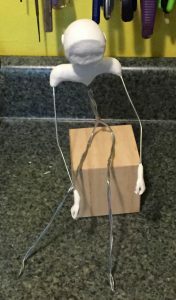 This sculpture is a bit larger and free standing, both ideas that I’d like to incorporate in future art dolls. “Delicate Landing” is a very recent sculpture created for our January show titled “Flow.” We worked with several local poets to honor conservation efforts along the Eno River. I decided to go all in on our nature theme, and use biodegradable materials as much as possible in her construction. 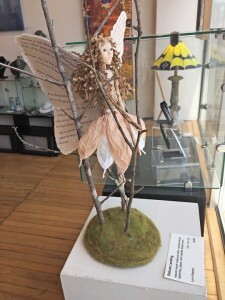 The wings of this wood sprite art doll feature text from Thoreau, Emerson and Aldo Leopold on nature and conservation. I like the extra point of connection provided by incorporation of text that might have played in the inspiration of a sculpture. I first explored this with my “Paper Alice” art doll. I look forward to sharing where these and other past sculptures lead me next. 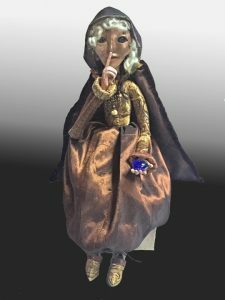 This entry was posted in Art Dolls and tagged art doll, Art doll show, copper, fairytale, figure, figure sculpture, Hillsborough Gallery, mixed media, one of a kind, OOAK, sculpture, the Hillsborough Gallery of Arts on March 25, 2016 by lynnadmin. 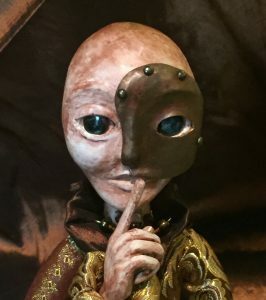 I just realized that a couple of weeks ago when I shared my latest art doll sculpture, “Santos Caitlin”, that I had promised to share details on the opening reception, and reading by Alan Gurganus. 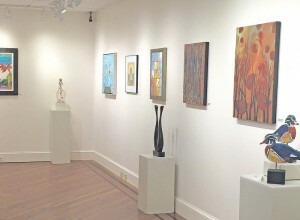 Well, we hung the gallery, I missed the opening due to another commitment, and we had the reading this past Sunday. So very sorry that I didn’t get the dates and times to you, but thank you to all that attended anyway. Luckily, the gallery promotional mechanism is much more regular that my bog posts. But, never fear if you wanted to see the show, because it will still be up at the Hillsborough Gallery of Arts until March 20th. Here’s a sneak peek. You can see my “Santos Caitlin” cage art doll sculpture on a pedestal against the far wall. Many of the pieces have accompaning text describing their inspiration from the Alan Gurganus novellas we read. There was a nice write up on the show in our local news paper The News of Orange. I now turn my attention to building a new body of work for my own upcoming feature show in September. It seems like a long way off, but early images and information for publications about our shows sometimes need to go out months in advance. It is good to have several pieces to choose from when they are called for. This means that I now have to start the yearly process of creating new sculptures that I sort of hold back from bringing into the gallery or putting up online for sale. Don’t worry, I will still share any art doll I’m working on here with you, but many will not be available until the feature show. I will be showing with two uber talented artists, Linda Carmel and Marcy Lansman. Our show will be titled, “Go Figure”, as the work of all three currently contains human figures. As for my own work in the feature show, I like to have a connected theme between the pieces I put in as well. I think I have my working idea, but I’m going to let it percolate for a bit before I share. This entry was posted in Art Dolls, Art Shows and tagged art doll, Art doll show, figure, figure sculpture, Hillsborough Gallery, Lynn Wartski, mixed media, one of a kind, OOAK, sculpture, the Hillsborough Gallery of Arts on March 4, 2016 by lynnadmin. My latest art doll sculpture is a santos cage doll based on a character from Alan Gurganus’ novella “Saints Have Mothers“. As some of you may be aware, each February at the Hillsborough Gallery of Arts we present a show entitled “It’s All About The Story” in conjunction with one the many well known Hillsborough authors. This year we were lucky enough to play with the content of the three novellas in Gurganus’ collection Local Souls. The stories in Local Souls are all set in Mr. Gurganus’ fictional town of Falls, NC. In “Saints Have Mothers” we are introduced to the character of Caitlin Mulray through the eyes of her mother Jean. Caitlin is an almost too good to be true character who is off during high school summer vacation volunteering in Africa. She is reported missing and dead by a scam artist, and before she is able to return, her mother and other members of the community start to plan a memorial celebration that mushrooms out of control. In researching my design for this sculpture I came across santos dolls. I had seen other cage art dolls before, but hadn’t made the connection between them and santos dolls. Most often seen dressed in elaborate robes for saint days and other festivals they are a type of folk art of sorts. The traditional forms are usually a carved and painted wooden head and torso that is set atop a cage base made of wooden slats or wire. 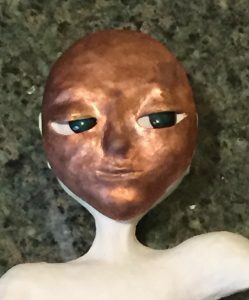 For an art doll based on a character from a story about a local “saint” the connection seemed almost too good to be true. I decided that my Caitlin sculpture needed to be a cage doll. Santos Caitlin features a web of tiny shoes within her cage skirt. One of the saintly tales of Caitlin’s good works was that she was constantly giving things away to charity, these contributions included most of her mother’s shoes. I find the use of copper and brass foils for her face and halo-like head piece add the look of an icon to the sculpture as well. Likewise, Caitlin’s midriff revealing top recalls the armor of Joan D’arc. My Santos Caitlin art doll figure sculpture will be at the Hillsborough Gallery of Arts starting the last week of February. I will post dates and times for the opening reception and the author reading once the show is installed. 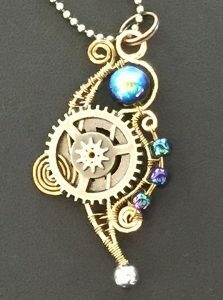 This entry was posted in Art Dolls, Art Shows and tagged Alan Gurganus, art doll, Art doll show, Art show, copper, figure, figure sculpture, Hillsborough Gallery, mixed media, one of a kind, OOAK, steampunk, the Hillsborough Gallery of Arts on February 6, 2016 by lynnadmin.